I usually have red beets in my refrigerator, as I love them prepared so many ways. I’ll throw one in my smoothie, chop a raw beet to add to a salad, or roast some beets to use in dishes throughout the week. 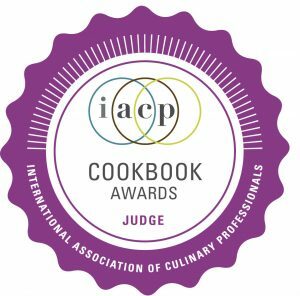 Discover how to make fresh Red Beet Pasta, Beet Dandelion Pesto or Red Beet Ravioli with Spinach and Goat Cheese by clicking on the links. From time to time I buy a bulb or two of fresh fennel, thinking it’s good for me. However, it’s not always easy to follow through on great intentions. So, I’m always open to new ways to use my fennel before it spoils. Fennel has a distinct anise-like flavor. Some people find it a bit too strong for them. However, when cooked, fennel becomes more sweet and subdued. Roasting fennel and adding it to pasta is not new for me. One example is my recipe for Pasta with Fennel and Fresh Garlic. Try that recipe for a similar version of this dish. Nevertheless, the roasted beets here elevate the flavor and complexity of this dish, making it utterly delicious. 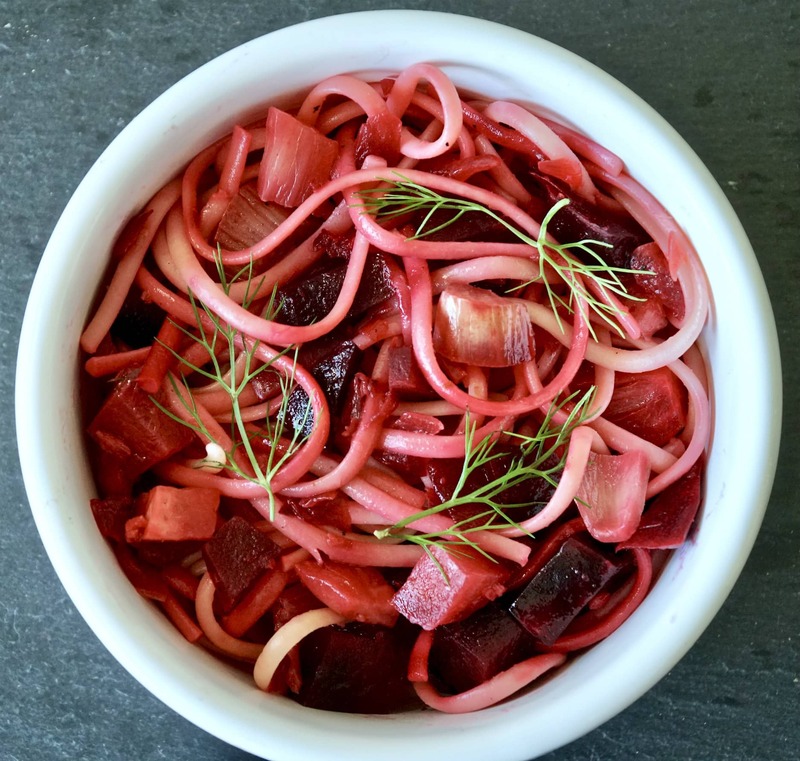 Although the red beets and fennel bring the most flavor to this savory dish, onions and garlic round out the main ingredients in this dish. 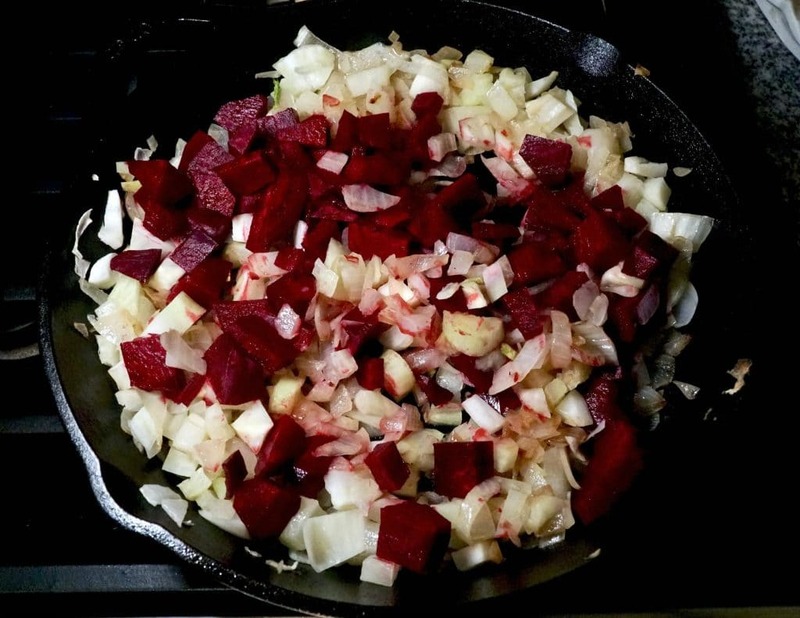 The sautéed chopped onion adds a sweetness that blends perfectly with the earthy flavor of the beets and fennel. The red beets, fennel and onion are cooked with a couple tablespoons of extra virgin olive oil. You can drizzle some walnut or hazelnut oil on top of your pasta dish to add a nutty dimension. 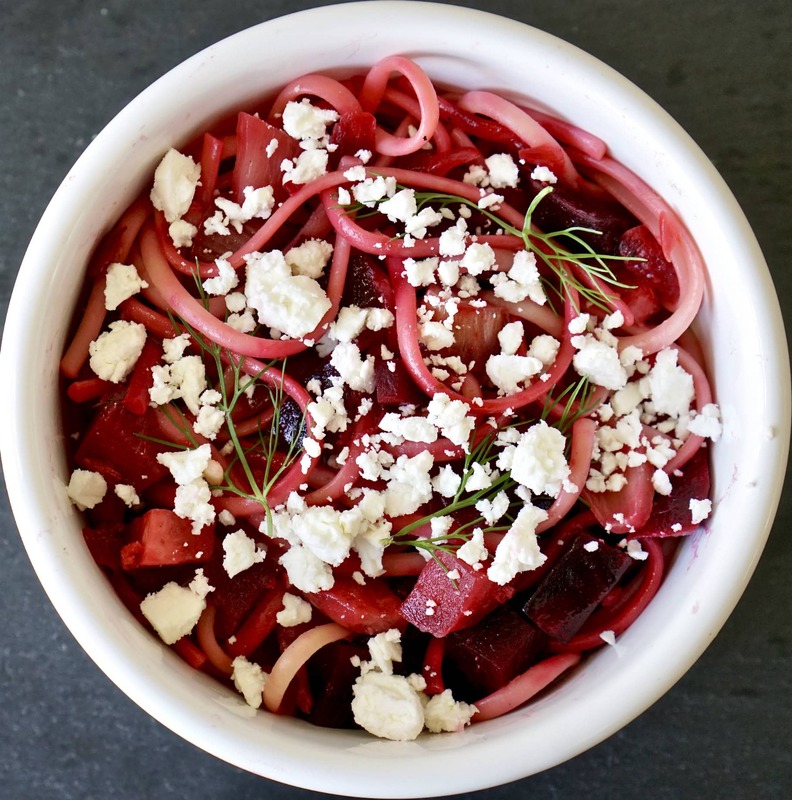 Grate a little Parmesan cheese or crumble some goat or feta cheese on top of your Roasted Beets and Fennel on Pasta to enhance the creamy nutty flavors of this dish. You’ll be pleased how these few ingredients can blend together to create such a surprisingly delicious meal. Vegans can enjoy this dish without any grated cheese. Adding some nutritional yeast instead can replace the nutty, creamy and slightly salty taste of the cheese. Yet, even without nutritional yeast or vegan cheese, you will appreciate Roasted Beets and Fennel on Pasta. I hope this dish will soon become one of your favorites when dining on your own or with friends and family. It’s an easy recipe to multiply for the number of servings you’ll need. Please use the social media links below to share this recipe with your friends. 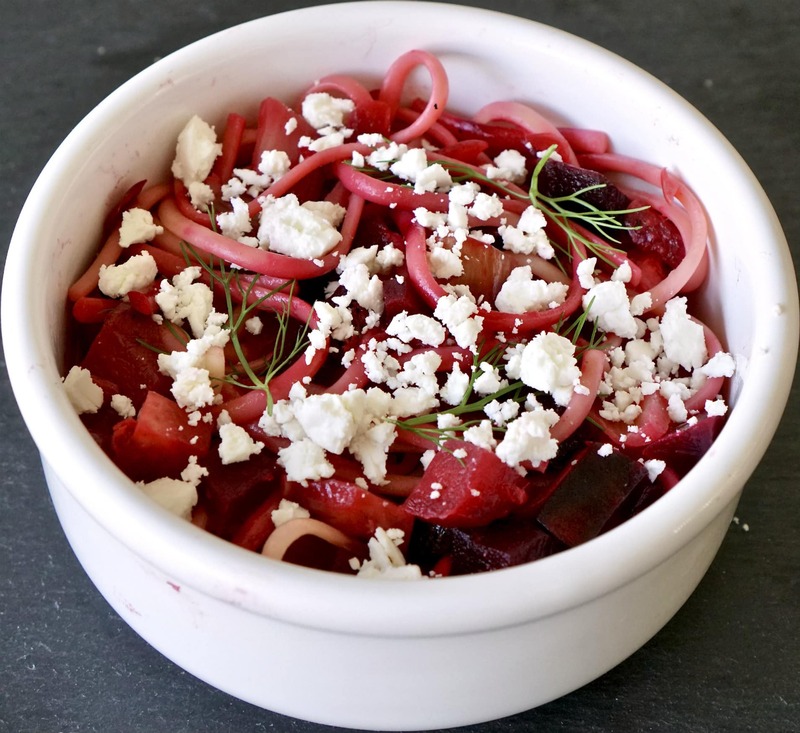 Prepare this Roasted Beets and Fennel on Pasta dish in 30 minutes! Beginner cooks will surprise themselves and their friends with this beautiful and delicious dish. Put water in a large casserole over a medium-high heat until it boils. When it boils add the pasta and cook according to the instructions on the box. While the water boils and the pasta cooks, prepare and cook the vegetables. Chop the onions, slice the red beets, and slice the white part of the fennel bulbs into bite-sized pieces. For the fennel remove the fronds and the green parts on top. You can put the fronds aside in case you want to sprinkle them on top of the cooked dish at the end. Pour the olive oil in a pan over a medium-high pan. When the oil is hot, add the chopped onions and sauté a couple minutes until they start softening. Reduce the heat to medium. Add the sliced fennel. Continue to cook about 5 minutes, stirring periodically. Add the red beets and continue to cook another 5 minutes. You may need to add a little of the pasta water If the pan becomes a bit dry or the pieces start burning, The pasta water will help the vegetables to cook and for the flavors to blend together. Add the minced garlic and cook another minute. The vegetables should be cooked, yet the red beets should be slightly firm (al dente). Remove a cup of pasta water before straining the pasta. Add a little more of the pasta water to the vegetables so you have a good consistency to add on top of the pasta. You will not need all the pasta water. Strain the pasta. In each bowl, put about a cup of pasta. Add the vegetable mix on top. Drizzle a little olive oil, hazelnut or walnut oil on top. Not much but just to give a hint of flavor. Put the grated Parmesan cheese or crumbled goat cheese in a bowl on the table to allow each person to add it if they like. Vegans can sprinkle some nutritional yeast instead of the cheese on top of their dish. If you prefer serving the pasta family style, mix the vegetable topping with the pasta before bringing it to the table. Thank you Brad for making this tasty and healthy dinner. I really enjoyed the sweet and bitter taste. Topped with some cheese it tastes really great. 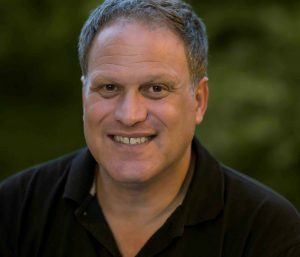 Thanks, Jan Erik! It was fun sharing this meal together. I love how quick and easy this dish is to make and to clean up. So glad you were here to enjoy it.